PPI Tokodai (Indonesia Student Association Tokyo Institute of Technology) will held a paper competition for students currently studying in Indonesia entitled “Tokyo Tech Indonesian Commitment Award (TICA) 2016”. This year the theme for the competition is “Sustainable Development. This competition was held as a form of support and appreciation to the research activities of students in Indonesia. Scientific research in connection with continuous development from science and engineering perspectives. Students from the science and engineering study program are encourage to participate in this cluster. The management and social aspect contributed greatly in the continuous development. Therefore, we also provide opportunity for students from the management and social study programs. This theme is highly inspired from the Japanese Monozukuri spirit which literally means ‘to produce’. In this cluster, each participant is asked to describe their research result in connection to continuous development by producing a prototype. Participants from any study programs are welcome to register in this cluster. Content. The paper will be graded based on topic compatibility, technical contents, scientific method usage, potential effect for technological development in Indonesia. Originality, all paper must be original and must be the works of the author. Works that have been published are not allowed to be entered into the competition. In this competition, the best participant of each cluster will be invited to attend the TICA 2016 main event in the Tokyo Institute of Technology campus, Tokyo-Japan to present their work and receive their award (transportation and accommodation will be borne entirely by the committee). 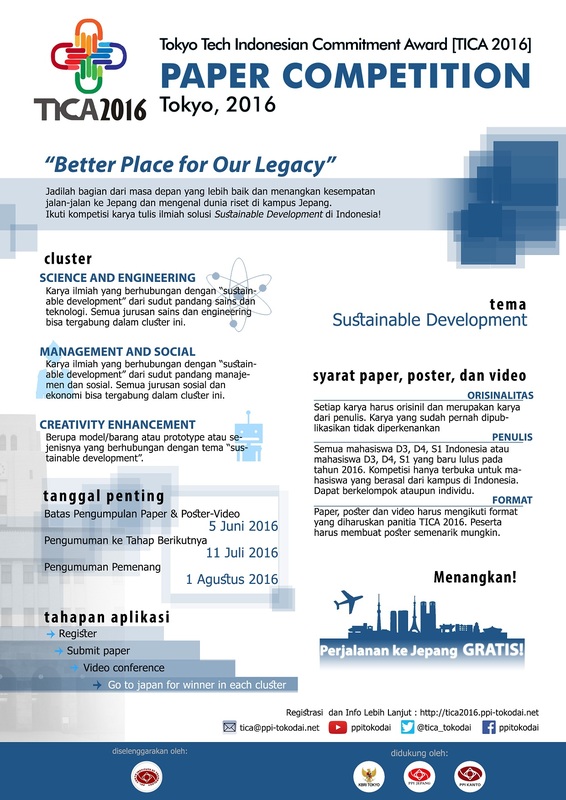 More detailed information on TICA 2016 can be seen from the following poster. Registration period and submission for TICA 2016: 11 April – 5 Juni 2016.